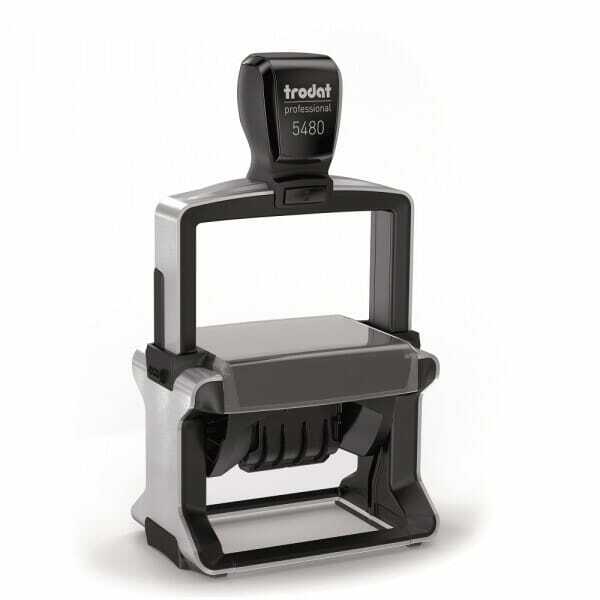 Trodat's Professional 5480 self-inking date stamp provides space for up to 8 lines of text and a 4mm date. This is perfect for fitting a large amount of text or text and a logo in addition to the date onto the stamp. The dimension of the complete impression is 65 x 44 mm with a date size of 4 mm The date band includes date, month and 12 consecutive years. 4 lines of text can be placed above and 4 lines of text below the date. The date is easily set by turning the date bands, creating an impression of blue text and a red date. The Professional self-inking rubber stamps range is extremely reliable due to the robust stainless steel framework. The positioning frame and rubber feet enable precise positioning of the stamp impression and there is an actual size index window for easy reference. To further extend the life of your stamp, order the suitable replacement ink pad 6/58/2 blue/red or single coloured pads 6/58 available in black, blue, green, red and violet. Dry felt pads are suitable for special inks. Customer evaluation for "Trodat Professional Dater 5480 - 64 x 44 mm"